As many games take a simplified approach to gameplay, stripping out options and streamlining action, TASTEE: Lethal Tactics flies in the face of convention and gives you all the depth you could ever ask for. 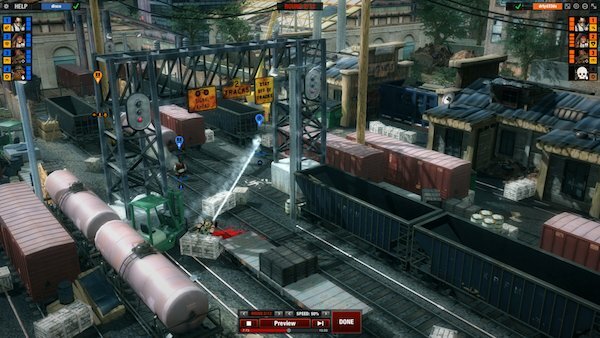 In TASTEE: Lethal Tactics, you manage a team of mercenaries for hire to take on various objectives using deep turn-based planning and combat from a birds-eye view. Your squad is based out of a ramshackle fast-food joint — the eponymous TASTEE — and is sent out on missions to eliminate foes, steal money and generally rain down wanton destruction on the world around it. The simple story is told with a tongue-in-cheek bent, and the whole situation is presented with an air of lightness that’s welcome in a world of bombastic and overly serious titles. If you’re familiar with turn-based tactical games like XCOM or Frozen Synapse, the ideas here will be familiar to you. Each of your squadmates has a variety of options that involve moving around a map slowly and methodically, peeking around corners and taking aim against your foes. You have several of the typical classes you’d expect at your disposal: snipers, demolitions experts, brawlers and general gunmen. Each of them can be used for different roles on the mission, but everyone has access to the same general action choices. These options for moving according to waypoints, turning your unit in a direction, hiding behind cover, and a handful of others are the key to your success on any outing. Each mission plays out over the course of several turns, and each of these rounds starts frozen in time, giving you a good look at what you’re up against. As you’re deciding how to approach the mission, your enemies — either AI or human — are doing the same. Once you’re satisfied with your decisions, you can lock in your turn and watch the action play out in real time. It’s only then that you will know whether you’ve made the right choices. 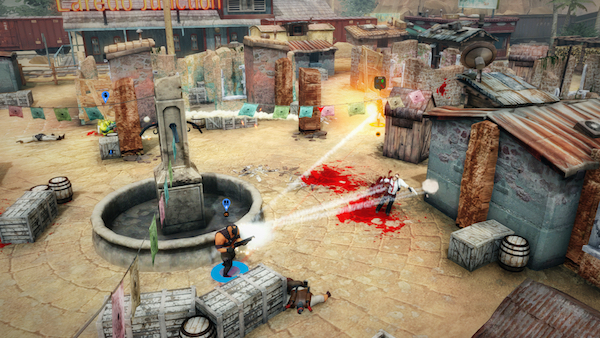 Given the wide array of maneuvers you can employ on any given mission, TASTEE: Lethal Tactics doesn’t bog you down with complex controls and endless menus. Controlling each of your team members feels completely intuitive, and after a brief time playing around with the controls, they’ll feel second nature. Moving, aiming, and using the camera to get a better vantage point all have the perfect feel, and the simple radial menus give you a quick overview of what your options are in any given situation. 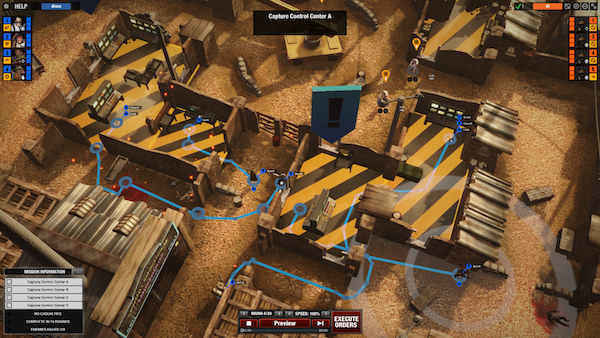 The strongest and most unique element of the game’s tactical controls come when using the preview option. Each step of the way during your planning phase, you can hit a button to get a glimpse of what might happen if you follow through with the plan. Using this option is vital, because all the moving pieces of any particular mission could get totally out of hand without a way of keeping track of them. While the ability is useful, it’s not exactly precognition. You’re only shown one possible outcome of your choices, and it doesn’t account for the positions or actions of hidden enemies. This way, you’re given a fighting chance against insurmountable odds without feeling like you’re using a cheat code. It’s a good thing that controlling the action feels so natural, because you’ll be doing it a lot. Each mission has several turns, and during each turn you’re likely going to move and act with each of your squadmates. And beyond that, you’re likely to try two or three different approaches with each character before you find the one you want to commit to. Depending on the objectives, you could easily spend an hour or more on a single level of the 30-mission campaign mode, which serves as a great introduction to the real meat of the game: it’s competitive multiplayer mode. 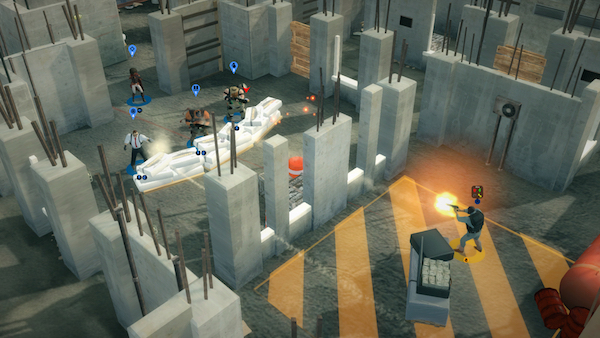 The developers at Skybox Labs have gone all-in with multiplayer for TASTEE: Lethal Tactics. Each match pits your squad of four mercs against an opposing squad, and rounds tend to play out largely like their single-player counterparts. The confined arenas you’ll be battling in mean that rounds start off frantic and deadly. But if you and your opponent can take out a few members of each others’ teams, the remainder of the match can turn into a deadly game of cat and mouse. These online engagements will have you thinking even more carefully and planning for even longer that the campaign missions. Fortunately, the game offers a great asynchronous multiplayer mode to combat this. If you lock in your plan for a round before your opponent is finished, you’re free to leave the match and go do something else while you wait. But you’re not just limited to what you can do within the game itself. You can actually exit the game entirely, go have a meal, or even wait overnight. Email notifications will let you know when it’s your turn, and then you can log back in and see how things played out. It’s an elegant solution to a complicated problem, and I found some real joy in this modern analog of the classic idea of chess by mail. There’s no getting around it: TASTEE: Lethal Tactics is challenging. Even with all the tools at your disposal for planning a round, things can go bad quickly, and one wrong move usually ends with a squadmate’s death. Considering the odds you’re up against, being a man down is not ideal. Sometimes it’s easier to just restart a mission from the beginning rather than limp your way to the end. But despite its difficulty, the game never feels unfair. There’s almost always more than one way to achieve a particular goal, and the sheer level of control you’re given over your squad’s movement puts the ball firmly in your court. You’re only limited by your own patience and imagination. The endurance and deep thinking required to fully mesh with the gameplay in TASTEE: Lethal Tactics will certainly turn some people off. It took a while for the game to really click with me. But for fans of tactical experiences, there’s something really special here. It goes deeper than many of the mainstream titles, and if the grand plans for ladders and ELO-based multiplayer play out according to plan, there could be something really special here.